Xiaomi’s new revolutionary product :Commercial drones at affordable price !!! China's largest smartphone maker Xiaomi is set to expand into a completely new market: making commercial drones at a price affordable for most Chinese gadget consumers, putting it in direct competition with Shenzhen-based drone maker DJI. While Xiaomi has yet to officially announce its plans to enter the drone market, the secret has been known for some time by many Chinese tech and industry executives. 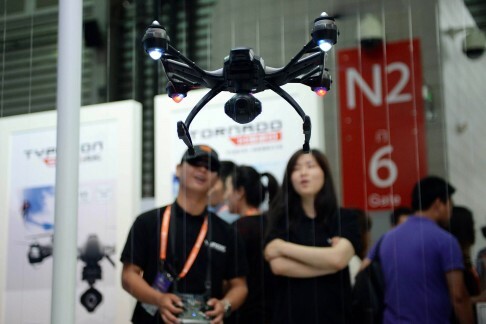 At the Consumer Electronics Show (CES) Asia in Shanghai last week, multiple industry sources confirmed to the South China Morning Post that Xiaomi conducted its first drone flight test earlier this year. “The result [of the flying test] was good and smooth. Now Xiaomi only needs to make some minor adjustments, especially with its layout design, so the Xiaomi drone won’t look too much like DJI’s,” said industry insider, speaking on condition of anonymity. Another source familiar with the situation said Xiaomi would likely launch its new drone product this summer, in time for the holiday shopping period. Xiaomi is currently valued at around US$50 billion, making it the fastest growing start-up in China in recent years. Fellow Chinese start-up DJI, which already controls more than 70 per cent of the global civilian drone market, is valued at over US$10 billion following its latest private fund-raising round which included investment from Silicon Valley venture capital firm Accel Partners. Entering the drone business follows Xiaomi's well-worn strategy of producing its own cut-price versions of popular technology products. This approach has gained the company some detractors, who accuse it of copying other firms' products. On the Chinese web, commenters joked that Xiaomi should be renamed xiao tou, or "thief", due to its long record of copying foreign innovation and design ideas - for example, Apple's iPhone - and then selling clones for incredibly low prices. Earlier this year, Xiaomi launched an air purifier, priced at a few hundred yuan. Weeks later, a Japanese electric fan maker claimed the design closely resembled its own product, according to Japanese media. Xiaomi denied the allegations, just as it did when challenged by fans of Apple about why its smartphone looked so similar to an iPhone. In April, Xiaomi unveiled new action cameras which retailed for around half the price of market-leader GoPro's products. The first batch of the Yi Action Camera, priced at 399 yuan (US$64), sold out in hours on multiple channels, powered by strong demand from surfers, skydivers and other action junkies. The GoPro Hero, the California-based company’s entry-level camera, sells for about US$130. Price will also be a key factor if Xiaomi is to effectively compete with DJI. The company is expected to target consumers who might be put off from buying a DJI product due to its relatively high price tag. The latest DJI Phantom 3, launched in April, retails at US$1,200. Demand is growing for drones to monitor public safety, shoot film footage and search disaster areas, while businesses are also using the technology in new ways, including farming, real estate, archaeology, and even for cleaning the exteriors of office buildings, according to a recent patent filed by a Chinese drone maker.